And what was left behind them? Local Oral History, The Ghost of Mali, Alpha Centauri System. For those that live on The Ghost of Mali station, the Catastrophe marked the end of an era of unquestioning trust and the beginning of an age of skepticism and fear of technology. Once a highly automated agricultural station, the mass destruction that occurred during the Catastrophe was credited to the malfunction of the multitude of machines and, despite the First Law, residents have grown hateful and suspicious of technology ever since. For some, that ignorance-bred fear may be authentic, but for others, this convenient excuse is seized upon in order to exploit cheap labor in the form of bond servants. I have worked my hands to the bone on The Ghost of Mali. My sweat feeds the ground and pumps through the vines for the nourishment of fat stargourds and towering sugarcane. The bladed leaves gnaw and tear, painting the stalks with the blood of my dying lineage. For my family, the station has been a labor prison, now three generations deep. We are exploited as the punchline of a joke, bathed in ignorance and fear. Here, they fear technology and higher functioning machines. Here, the demand for constant productivity is so thick that they use bond servants for the on-going agricultural work. People are kept quiet and in-line with this pervasive fear painting the boundaries of our freedom. On and on, this cycle flows, momentum motivated by the belief that the Catastrophe devastated The Ghost of Mali only by the use of their own machines as weapons. It is a strongly held, strange belief. There was a great shaking of the station, the full power grid flickered, then stabilized. All of the station’s technology seemed to turn of us. We were to be purged and tilled over like the turning of the fields. The storytellers of the Farmers’ Market, with the cultural tradition of history being that of an oral nature, sing warnings to those that pass by. Not to celebrate a time that has passed, but rather to incite pride on that what will be: the resistance to change and the station’s wealth, ever growing through the production of produce. My family was never found guilty of a crime. This sentence is one of forced social strata. When the machines turned on the station, having churned bodies and flooded fields, those families with the ability to claim and defend strips of farmland, uncontested, were the victors. Human progress which feeds upon class discrimination knows no boundaries of humanitarian ethics. I come from gentle people, but the gentle people were starving. All of us who wished for unity, community, and negotiation were overwhelmed and outnumbered by the aggressive few. We were eventually offered food, but the price was to submit and to serve. Our survival depended on this submission and servitude. So, we did, and so we still do. 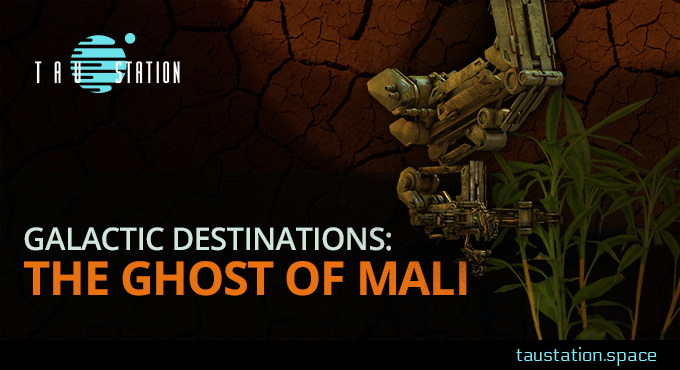 The Ghost of Mali remains largely unchanged since those early days after the Catastrophe. A handful of families hold control of the local oversight of the station while the rest of us work under the guise of paying off the debt of our existence. We are reminded to be grateful to those we serve: without their mercy we would have starved. But perhaps the time is coming where those in control will falter. It doesn’t take long for humanity to swallow their fear and begin to fight with an uprising. Allies can be found in the strangest of places. It doesn’t take long for a resistance to be born.